We are engaged in manufacturing and supplying an extensive range ofChenille Patches. Our entire range of these patchesincludes different color combinations and a plethora of designs. 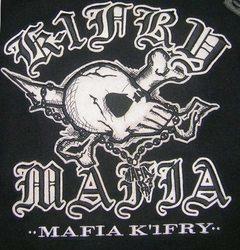 These patches can be eassily applied on any kind of cloth or fabric. We offer these at industry leading prices to our customers. We are engaged in manufacturing and supplying an extensive range of Chenille Patches. Our entire range of these patches includes different colour combinations and a plethora of designs. 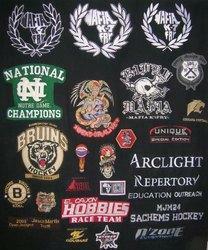 Our patches are easily and conveniently applied on any kind of clothes and fabrics. We offer these at industry leading prices to our customers.We are specialized in Chenille & Embroidery Patches.We can make all design & style of chenille/embroidery patch. 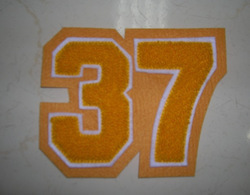 We are Leading manufacturer and supplier of Chenille Letter Patch. We represent our core commitment to creating handsome style in fashion, besides ensuring premium quality & standard. The company " Caliber India" complements the fashion statement in a unique way to help customers cherry pick from myriad collection & feel better & look better. We are engaged in manufacturing and supplying an extensive range of Chenille Patches. 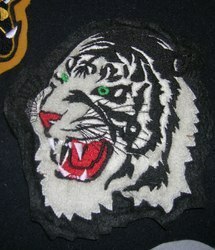 Our entire range of these patches includes different colour combinations and a plethora of designs. Our patches are easily and conveniently applied on any kind of clothes and fabrics, and measurely deals in USA, NEWZELAND, AUSTRELIA European countries"
Of all our lettered patches, the patch with R21 imprinted on it is also one of the trendiest patches. The designs are emboldened, eye catching and impressive, which is the reason that they are used in a variety of apparel and are greatly preferred by customers. We pay due attention to quality, to ensure they abide well on that aspect as well. We are an eminent name, which is engaged in delivering academic patchesat clients' premises. The offered range of letter patches is stitched utilizing high grade fabrics and innovative technology in complete adherence with the international quality norms. We are a leading manufacturer and supplier of a wide range of Latest Chenille Patches that are highly acclaimed for their elegant embroidery and crafting. Our craftsmen use superior quality cotton looms to make these patches. Our range of chenille patches is available in vibrant colours, magnificent patterns and exclusive designs.